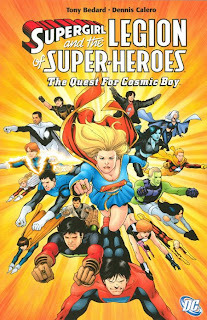 Tony Bedard's Supergirl and the Legion of Super-Heroes: The Quest for Cosmic Boy is a surprisingly complex, well-crafted comic book story. Though Bedard has a significant comic-writing track record, the only story I'd read by him was a somewhat off-the-cuff issue of Legion in the Dominator War trade, and I was worried how a full set of issues would work out. Quest for Cosmic Boy, as it turns out, was not what I was expecting--it was better. In The Quest for Cosmic Boy, newly-elected Legion leader Supergirl is encouraged by Brainiac 5 to send three teams of three Legionnaires out to look for the missing Cosmic Boy. On Winath, Lightning Lad's home planet, Brainiac sets up Mekt Ranzz to take the blame for Cosmic Boy's supposed war crimes; on Lallor, Brainiac has the team rescue abandoned Legionairre Wildfire; and on Earth, he arranges for Supergirl to return to her own time. There's no resolution for Cosmic Boy in these pages; instead, Quest for Cosmic Boy turns out in the end to be a deceptively complicated Brainiac 5 story--and that, we might say, is how Brainiac 5 stories should be. With "Rashomon"-like skill, Bedard weaves four or five stories, moving backward and forward in time until Brainiac's plan comes clear in the end. This makes for confusing storytelling initially--at first I thought Bedard glossed over events far too quickly--but every piece and string is masterfully fit and tied by the end. That said, most of the plot here works to tie up loose ends from the "Dominator War" storyline. There's not much here to attract new readers, who're probably better off starting with the first Jim Shooter trade to come, or even with the next Legion reboot. As has often been a problem in the various Legion remakes, this book spends a little too much time on Legion in-jokes, like the ERG-1 talking about the Legion "starting a wildfire" or Tenzil Kem's eating abilities. I also felt like some characterization was lost in both Bedard and Mark Waid's Legion stories, under the assumption that the reader already knows who these characters are from past Legion incarnations--how and why the Wanderers have a Coluan* who's not as smart as Brainiac 5, or what the deal is with Jeyra Entinn, is never fully explained. Not only does Mark Waid hand the reigns to Tony Bedard in this trade, by the way, but Dennis Calero takes over for Barry Kitson. In contract to Kitson's mainly straightforward super-heroic art, Calero's work is far darker and more shadowy, colored with a watercolor palette. It's an unlikely choice for Legion of Super-Heroes, but one that I thought worked quite well for this in-between storyline. I wouldn't mind seeing Calero elsewhere, either on a story with a tone that lends itself better to his art, or even as a change on another super-hero book. Me, I'm a sucker for continuity, and one difficulty I've always had with Legion incarnations is how, being in the future, the title often doesn't have any connection to the DCU proper. Well, between Booster Gold's cameo in the last trade and the ties to World War III here, I've been impressed with how this Legion has been integrated with the DC Universe (even as it may not last that much longer). I only wish there'd been a way for Legion to actually influence World War III, like Brainiac 5 actually having a hand in defeating Black Adam, perhaps. But overall, I've enjoyed the series's relevance. The Quest for Cosmic Boy doesn't move this Legion title forward much, but it's a nice interlude in this Legion incarnation, especially as the clock begins to run out on it. It's also helped to cement Tony Bedard's reputation for me, and I'll be eager to see what he does next. * What's Brainiac 5's favorite drink? A Coluan and cream! Ha!